The 3.7-inch How was designed before WW1 but did not enter service until about early 1917, and was used in Palestine and East Africa with both British and Indian mountain batteries, although the first users were probably the Hong Kong & Singapore battery with the Imperial Camel Corps in Palestine. Between the wars they were used on the NW Frontier of India and developed a reputation for accurate and consistent shooting. During the 1930's they were also used in light batteries in regular British infantry divisions. Designed as pack artillery they could be disassembled and carried by mules or towed by short draught (no limber). In the 1930's they were further adapted for vehicle towing, the Mk 2P carriage. During WW2 they had some use in European and African theatres and initially with airborne batteries, being generally but not entirely replaced by 75-mm M1, 3.7-inch How batteries accompanied 1 Cdo Bde across the Rhine at Wesel in 1945. However, they were most widely used in Burma, mainly by Indian mountain batteries but also by British field and light batteries, and continued to serve on India's NW Frontier. A few were also used in Guadacanal by RNZA and New Guinea by RAA. Production was transferred to India and during WW2 798 carriages and 805 ordnances were manufactured there together with some 2.7 million HE rounds. A HEAT anti-tank shell was specifically developed and produced for use in Burma. Ordnance Mks were 1 and 3, and Mk 1 had several sub-Mks with differing breech mechanisms and different rifling, and the barrel was in two pieces. Mk 3 was a single monobloc forging with an integral breech ring. 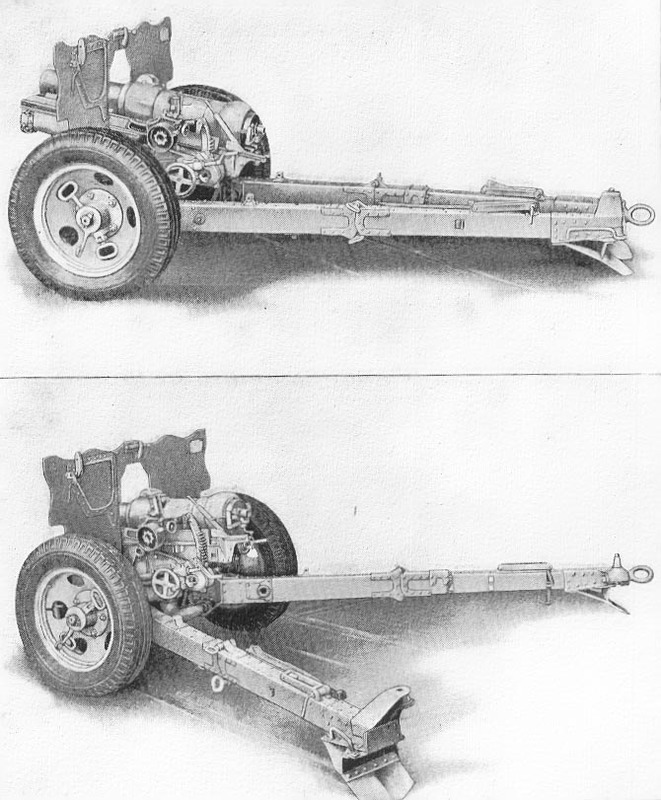 Carriages went through Mks 1 - 4 British and Mk 2 Indian, Mk 4 was the version for vehicle towing and guns were converted to this Mk. Mks also had different trails and shields Both pneumatic and wooden wheels were used, the latter being used with mule transport. There were several different shapes of shield. Modified versions were also designed and manufactured in South Africa. 190 '3.7-in Howitzer' and 101 '3.7-inch Pack Howitzer', the former seem to have had a one piece monobloc barrel. Ammunition was also produced in South Africa. 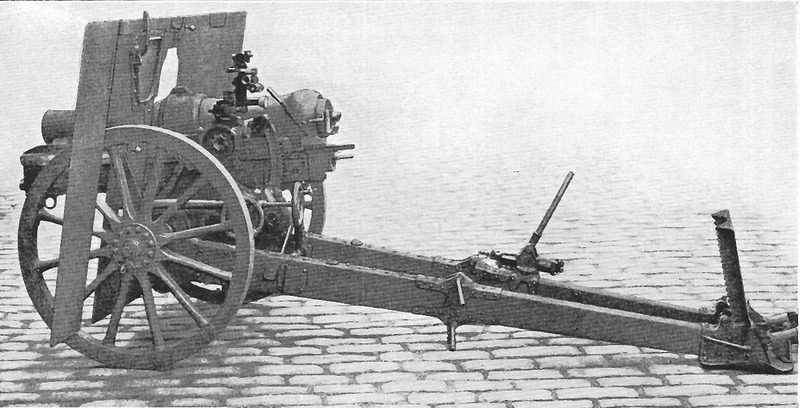 3.7-inch Howitzer Mk 1 on Carriage Mk 1 - A 'studio' picture, the airpump used to replenish the recuperator has been fitted to the trail. 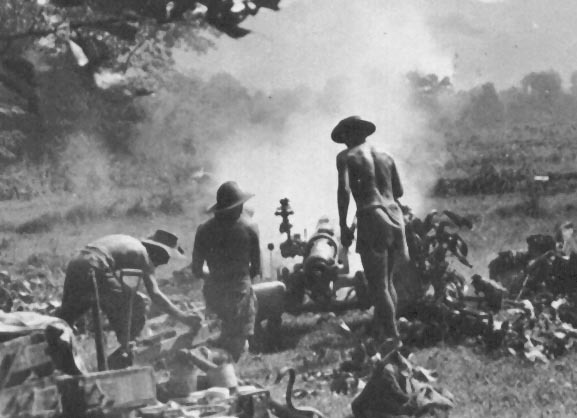 3.7-inch Howitzer - in action in Burma, probably 451 or 455 Light Bty. There were 3 additional men in batteries using animal transport. 26/Manuals/1002 HE, 4 CRH, Charges 1 to 5, 1931. 26/Manuals/2064 HE, 4 CRH, Charges 1 to 5, 1939. 26/Manuals/3049 HE, 4 CRH, Charge Super, 1942. 26/Manuals/3473 HE, 4 CRH, 20 lb, Charges 1 to 5, 1945. 26/Manuals/3605 HE, Upper register, 20 lb, 1947. 26/Manuals/1391 QF 3.7-inch Mk 1 Howitzer on Mks 1 - 3R Carriage, 1934. 26/Manuals/1664 QF 3.7-inch Mk 1 Howitzer on Mk 4 Carriage (Provisional), 1936. 26/GS Pubs/432 QF 3.7-inch Mk 1 Howitzer on Mks 1 - 3R Carriage, 1941. 26/GS Pubs/432 QF 3.7-inch Mk 1 Howitzer on Mk 4P Carriage, 1941. 26/Manuals/469 QF 3.7-inch Howitzer Mk 1 on Mks 1, 2 & 3 Carriage, 1930. 26/Manuals/1738 QF 3.7-inch Howitzer Mk 1 on Carriage 3.7-inch Howitzer Mks 1, 2, 3 & 4P, 1939. WO Code 1450 3.7-inch Howitzer, Ordnance QF Mks 1, 1/1, 1/2 and 3 on Carriage Mks 1/1, 2/1, 2P, 3/1 and Mks 2, 2/1 Indian, 1946. Copyright � 2004 - 2014 Nigel F Evans. All Rights Reserved.